If you don’t care about my entertaining jibber jabber, scroll down to the lesson. This morning I came across a notebook I took some notes in a few years ago. It was from my first pregnancy. During your first pregnancy you enter a book-reading phase. For some people that is about pregnancy and infant care. I didn’t bother too much with that. Most babies survive the care habits of their parents. I was more worried about the actual parenting part,where most people (myself now included) are messing it up. I assumed I wouldn’t have time to read many once I was in the thick of it. I assumed correctly. What I found in my notebook was either a quote or a paraphrased portion (It troubles me greatly that my notes make this unclear) from Noise: How our Media Saturated Culture Dominates Lives and Dismantles Families by Teresa Tomeo. 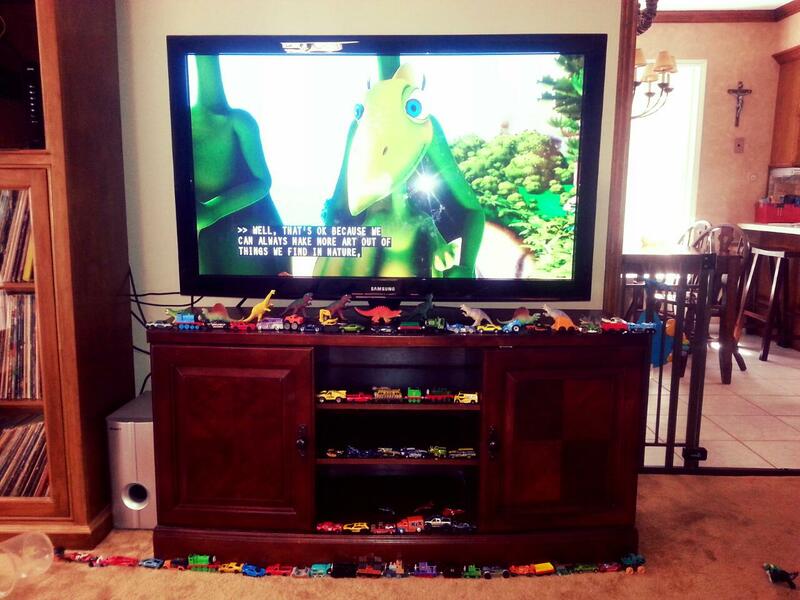 While these cars, trains and dinosaurs in rows is actually more a manifestation of acute OCD/the Engineering mind that runs rampant in my family, you cannot help but notice how much it looks like an adorned shrine. I hate how large our television is. It was free with the couches in a promotion five or six years ago, but it is a focal point in that room. It is an imposing dark presence when it is off, beckoning you to stare at it. It is a distracting noise we all sort of ignore when it is on. While all of this has me considering the changes I know I need to make in our household, it also got me thinking what a great Social Studies and Writing Lesson it could become. 1. Read a modified version of the extended metaphor above to the class. It needs to be modified as the sexuality component is not appropriate in this setting. 2. Allow for a discussion that moves from the impact of television to computers and smartphones on our lives. Young students may not immediately infer that this is about television, so it would also be a good inference lesson. Discuss how someone who likes the way television has transformed our culture would have written this differently. 3. Have them create, write and then share their own extended metaphor patterned after this one, but pertaining to cell phones, the internet, or some other technological influence. This entry was posted in On the Home Front, On the School Front and tagged cross curriculur metaphor lesson, television lesson, too much television, tv extended metaphor. Bookmark the permalink.